The thousands of tapes include unheard recordings of future Led Zeppelin legend Jimmy Page, David Bowie as singer and saxophone player with the Konrads, and Welsh singer Tom Jones. The collection of over 5000 recordings has been added to the It's More Than Rock And Roll sale to be held at London's Idea Generation Gallery on 4 September. Their estimated value is £300,000. 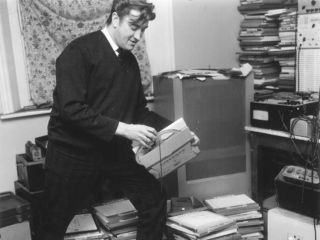 Ted Owen, Managing Director of the Fame Bureau, says: "To describe Joe Meek as a rock and roll icon is an understatement - he was one of the most important figures in the industry for nearly two decades and these tapes provide a vicarious passage of the 1950s and '60s." Meek became an icon of the recording industry with his experimental techniques in the '50s and '60s. He was most famous for The Tornados' 1962 hit Telstar which won him an Ivor Novello Award. British actor Nick Moran is currently directing a film of Meek's life, called Telstar, starring himself and Kevin Spacey.